Jahri Evans is a key figure in an offensive line that has ranked among the NFL’s best units since 2006 and surrendered the fewest sacks in the league over the last three years. An immediate starter since being drafted in the fourth round in 2006, Evans has gone from being a little-known rookie from a small school to an established veteran now considered one of the NFL’s top right guards. He has made the rapid ascent because of his maturity, work ethic and ability – with strengths that include both polished pass-protection skills and powerful run blocking. Another of his qualities has been dependability, as Evans has started all 64 games of his NFL career. Agreed to terms on a seven-year contract; Re-signed to a one-year contract (RFA), 4/21/09; Signed to a three-year contract, 7/25/06; Selected in the fourth round (108th overall) of the 2006 NFL Draft. HONORS – 2009: Pro Bowl-starter, Associated Press All-Pro, Pro Football Weekly/Pro Football Writers of America Association All NFL, The Sporting News All-Pro. 2006: Pro Football Weekly/PFWAAll-Rookie, Dallas Morning News All-Rookie. 2009- Started all 16 games at right guard for the fourth consecutive season and was named to the starting lineup for the NFC in the Pro Bowl, his first career Pro Bowl selection. vs. Detroit (9/13): Started at RG and helped lead the Saints to 515 yards of total offense, with 157 rushing yards and zero sacks allowed in the 45-27 Opening Day win. at Philadelphia (9/20): Made his 50th career start and helped lead the offense to 421 yards of offense in a 48-22 victory. at Buffalo (9/27): Started at RG and helped lead the way for the team’s 222 rushing yards. vs. NY Jets (10/4): Started at RG and helped to hold the Jets’ defense without a sack and the Saints to rush for 153 yards in the 24-10 win. vs. NY Giants (10/18): Started at RG and paced the offense to 493 yards and 48 points in the win over the previously unbeaten Giants. at Miami (10/25): Was the starting right guard in the team’s 46-34 victory. vs. Atlanta (11/2): Started at RG in the Monday Night win. vs. Carolina (11/8): Was the starting right guard in the win. at St. Louis (11/15): Started at RG in the victory, a game that saw the team gain 203 rushing yards. 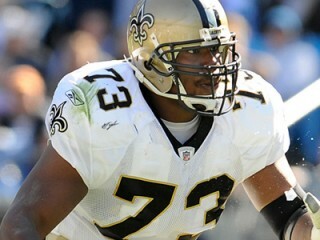 at Tampa Bay (11/22): Started at right guard and helped to keep Drew Brees sack-free in the win. vs. New England (11/30): Was the starting RG in the victory. at Washington (12/6): Started at right guard in the overtime win. at Atlanta (12/13): Started at RG in the win, helping to keep Drew Brees without being sacked. vs. Dallas (12/19): Started at right guard. vs. Tampa Bay (12/27): Started at RG. at Carolina (1/3): Started at right guard. vs. Arizona (1/16 – Divisional Playoff): Started at right guard in the win and helped keep Drew Brees from being sacked. vs. Minnesota (1/24 – NFC Championship Game): Was the starting right guard in the overtime victory. vs. Indianapolis (2/7 – Super Bowl XLIV): Started at RG in the win. 2008 – Part of an offensive line that allowed just 13 sacks on the season, a club record…Started all 16 games at right guard for the third-straight season, completing the year with a streak of 48-straight contests. 2007 – Continued his solid play for an offense that ranked No. 3 overall in the NFL…Started all 16 games at right guard. 2006 – Emerged as one of the line’s most consistent performers in training camp and was a starter by early in preseason...Started all 16 games at right guard and both playoff games...Recovered a fumble vs. Philadelphia, Oct. 15. COLLEGE – Finalist for the Division II Gene Upshaw Offensive Player of the Year Award in each of final two seasons…Anchored the Bloomsburg offensive line at LT after taking over as the starter as a sophomore…As a junior had 88 knockdowns with 10 TD-resulting blocks…Was a reserve in 2002 and redshirted in 2001. PERSONAL – Attended Frankford (Philadelphia, Pa.) HS…Exercise science major…Born Aug. 22, 1983 in Philadelphia, Pa.
View the full website biography of Jahri Evans.